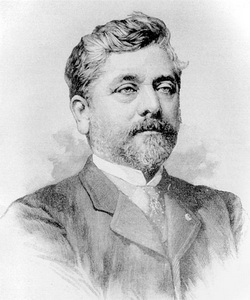 French engineer Gustave Eiffel is known best for the tower that bears his name. During his long life, he created many other impressive metal structures, especially bridges. He also created an aerodynamics laboratory, which he gave to the French government two years before his death. Eiffel was born in Dijon, France, in 1832. He became interested in the techniques and problems of construction at an early age, and studied at the Ecole Polytechnique and the Ecole Centrale des Arts et Manufactures in Paris, where he graduated in 1855. His first professional project was to build a railway bridge to span the Garonne River in Bordeaux. He designed and constructed numerous other bridges over the next few decades, including a 525-foot steel arch bridge in Oporto, Portugal, and a 540-foot version of the same design in Truyere, France. This was at the time the highest bridge in the world, crossing 400 feet over the stream. He pioneered the use of compressed air in the caissons (floating supports) of his bridges. In 1867 Eiffel showed his love of tall, arched structures with his creation of the Galerie des Machines for the Paris Exhibition. He also created a movable dome for an astronomical observatory in Nice, France, and constructed the framework for the Statue of Liberty. Then, in 1889, the committee set up to commemorate the one hundredth anniversary of the French Revolution in 1889 announced a contest to design and build a monument to the revolution. Eiffeldesigned the winning entry. The Eiffel Tower, as it was called, stunned the world. 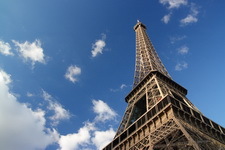 Some called Eiffel the "magician of iron" for his feat of creating the world's tallest structure in two years. All twelve thousand of the components of the tower were made in factories, fitted together with two and a half million rivets, and designed to resist wind pressure. Eiffel also included two elevators in the structure. When it was first built, however, the Eiffel Tower was criticized by many as ugly, oversized, and useless. It dominated the landscape of Paris, a symbol of modern technology and construction techniques. Only years later did the tower gradually come to be recognized as a beautiful work of art. 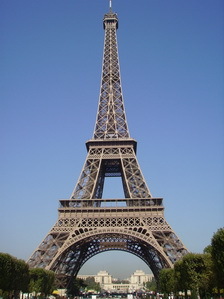 Eiffel himself found immediate use for the structure, which soon became a major tourist attraction. He dropped objects off the tower via a wire slipway, and measured how fast they were going when they hit the ground. These experiments in aerodynamics led Gustave Eiffel to construct a laboratory for the study of aerodynamics in Paris in 1908; it was the first such laboratory in the world. Four years later, he opened a new laboratory that featured higher wind speeds in the wind tunnel. Eiffel wrote of his work in aerodynamics in several books, which were published between 1907 and 1919. His advances included data on airplane models, airfoils, and a theory of the flight of objects heavier than air. He took airplane design and showed how it could be reduced to engineering terms. He also showed how wind tunnels could be used to simulate actual flight conditions, allowing for the testing of new airplane designs without risking pilots' lives. His most influential book was Resistance of the Air and Aviation, which was translated into English in 1913. He died in 1923, after presenting his aerodynamics laboratory at Auteuil to the government of France. © Eiffel Tower in Paris - Powered by EiffelTowerGuide.com - All rights reserved!